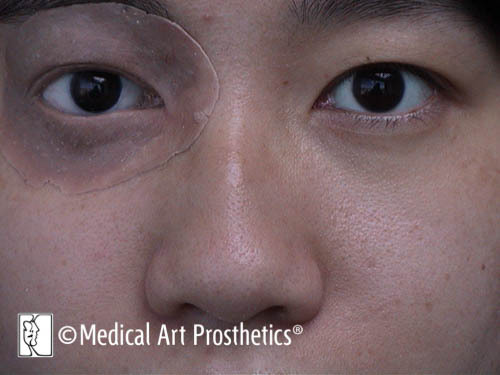 We renew the natural you with Orbital (Eye) Prosthetics with personalized care and precision medical artistry. 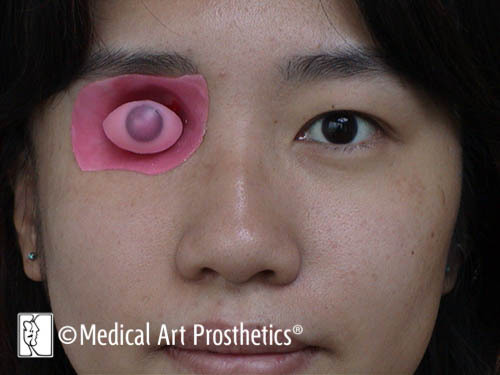 The approach of Medical Art Prosthetics toward the creation of an orbital prosthesis involves medical, artistic and prosthetic components – none being more or less important than the others. Trained in basic medical sciences we understand involved anatomy to communicate with surgeons. Skilled in art we call upon natural talent to render color and form in ways that no technology can. 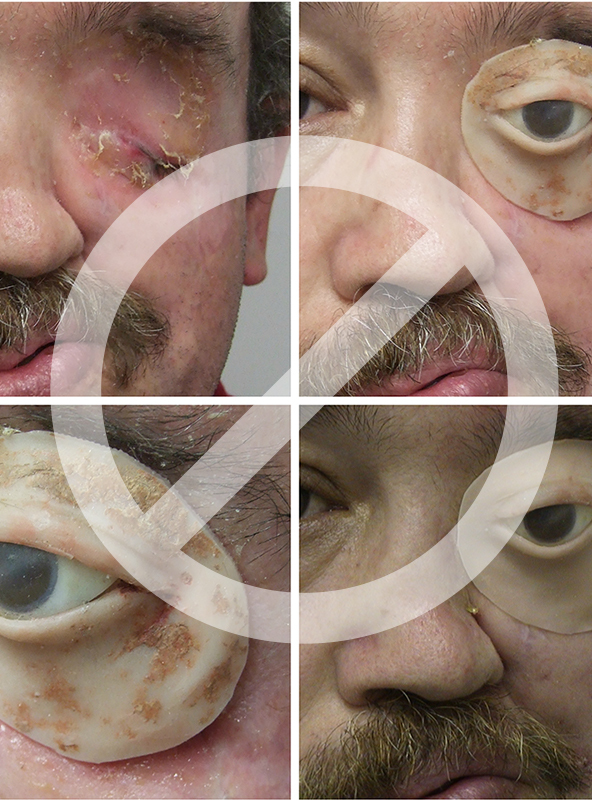 Experienced in prosthetics, specifically facial prosthetics, we have designed, fabricated and fit more truly aesthetic orbital prostheses than any provider in the United States. Our design sessions are comfortable for the patient and productive for the facial anaplastologist because our specialized environment is quiet, relaxed and conducive to the unique creative technical process. Some visit us from the other side of the world for the process and results we offer. 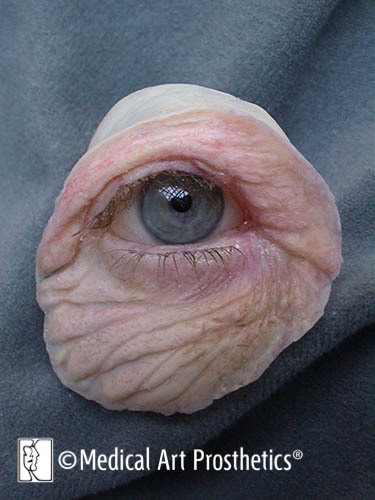 We can create for you a life-like, natural-looking new orbital (eye) prosthesis. 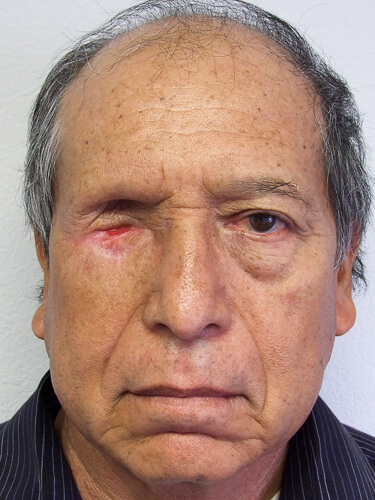 Orbital prostheses should be almost indistinguishable from the orbital area on the unaffected side. Since the eye changes with changing expressions, the orbital prosthesis will never be perfectly symmetrical 100% of the time. 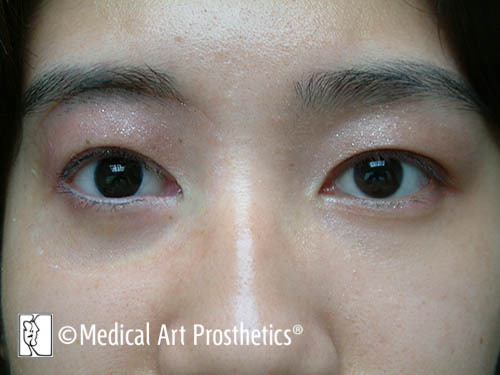 However, it should be balanced, possessing a neutral or averaged expressiveness and highly nuanced with individualized skin characteristics, eyelash/brow treatment, even simulation of skin fluids. 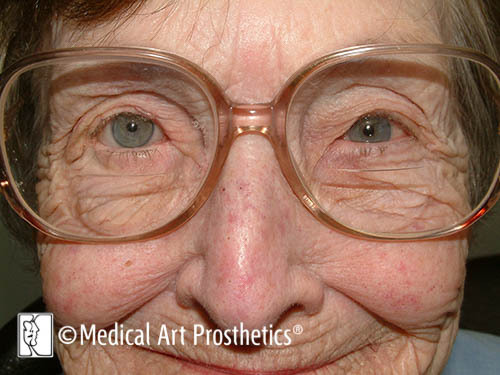 Generally, silicone orbital and other facial prostheses are expected to last several years before needing replacement. Design and materials play a large role in how long a prosthesis will last, but we always make an effort to follow our clients and be accessible for follow-up care. 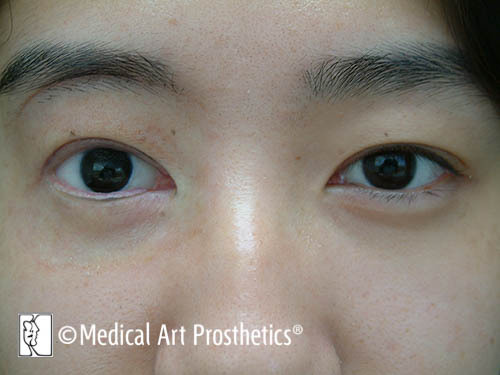 Longevity of this prosthesis was evidenced by our loyal patient’s return 14 years after receiving her first prosthesis. This was provided in our long standing partnership with Strauss Eye Prosthetics, Inc. based in Rochester, NY. Orbital prostheses are developed painstakingly by Medical Art Prosthetics, and they are crafted using many materials and treatments – more as a mixed media art project than as are functioning prostheses such as limbs and joints that are molded, milled, and bolted together. Some of our orbital prostheses were developed using digital scanning and prototyping technology. 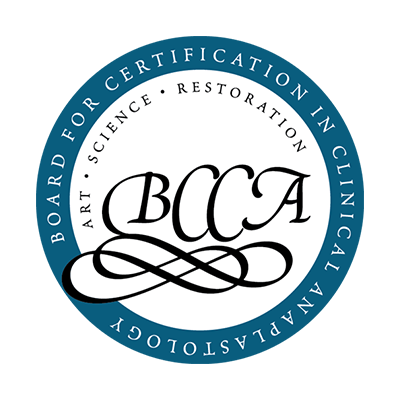 The important message is that “advanced technology” sounds impressive but it is not synonymous with quality care or beautiful restoration results. 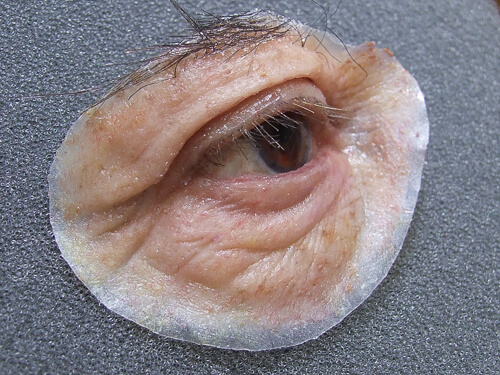 Application of prosthetic adhesives remains the conventional method and a very reliable and secure means of attaching orbital prostheses. We employ the best adhesives and placement strategies based on 35 years of experience specifically in this specialty. 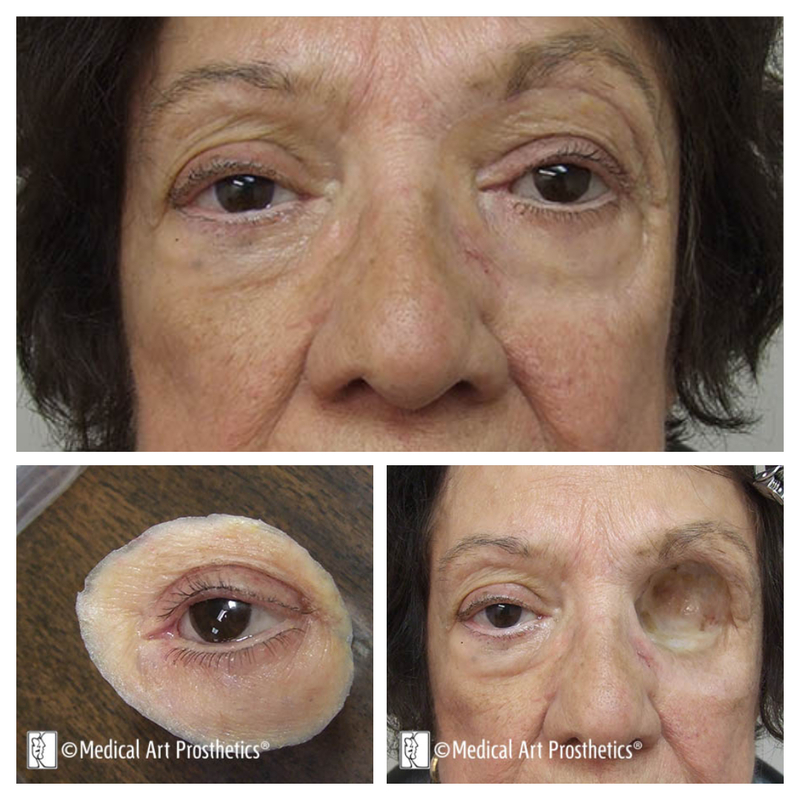 The nuanced methods, tricks and techniques we have developed working closely with hundreds of orbital patients are all brought to bare making adhesive daily use ever-easier for each new patient. Mastery of adhesive management is empowering and we see it all the time. 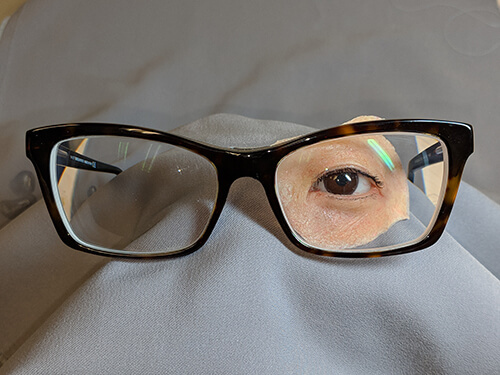 When patients have very delicate skin or adhesive sensitivities or prefer the simplest way to wear their prosthesis without surgery we simply attach the orbital prosthesis to attractive eyeglasses. Experience again helps us know the best materials to use, the styles of glasses that work the best, and the cleverest molding techniques to maximize aesthetics, camouflage and durability of the system. Its an old-school method, but when done well its perhaps the most elegant and liberating of all. There’s no method we have not either developed ourselves or employed to ensure success for our patient. Here we are verifying that our patient can remove and replace her prosthesis in a predictable manner. 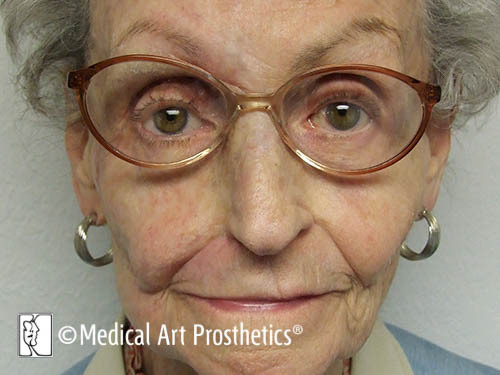 Our patient her has complete confidence in moving and talking with her orbital prosthesis. 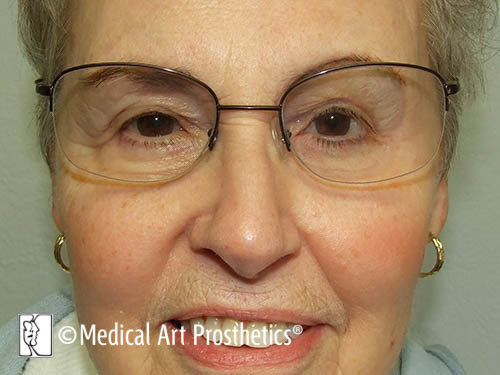 Her orbital prosthesis is inconspicuous and secure without bone anchored implants and without adhesives. 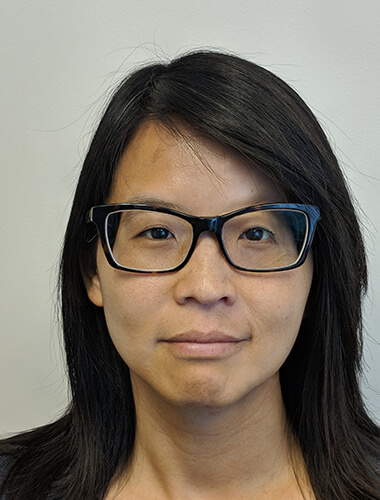 This elegant attachment to her eyeglasses allows super-simple carefree use of her prosthesis so she can concentrate on the things she enjoys. 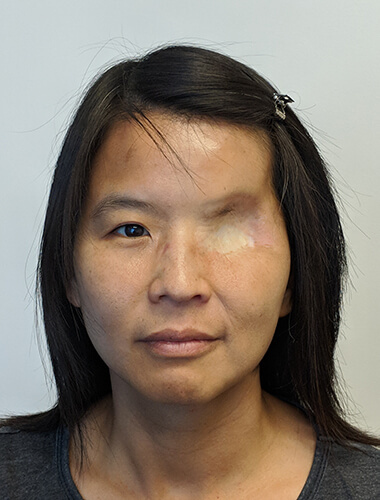 This patient has received a hollow extremely lightweight orbital prosthesis that slips in and stays secure requiring no adhesive, no bone-anchored implants and no other mechanical means of retention. 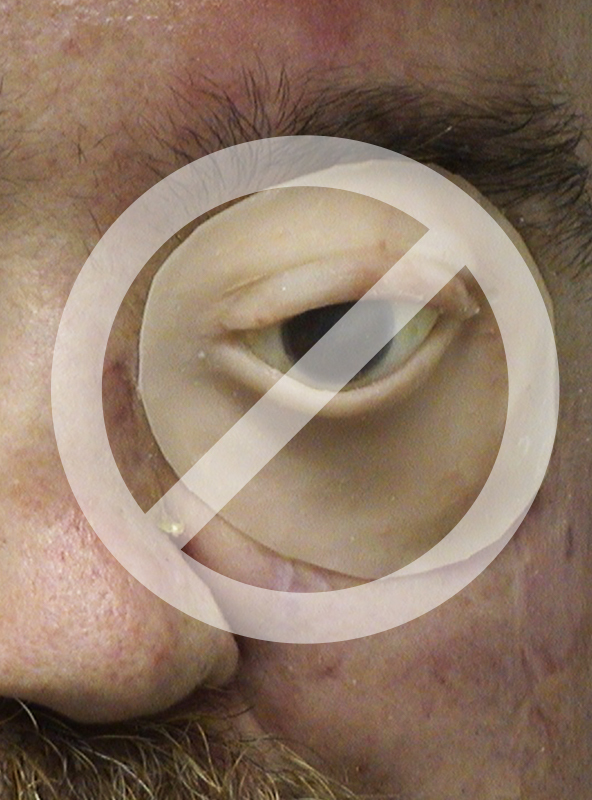 This technique was published in a chapter written by Greg Gion, MMS, CCA on orbital prostheses in the textbook Facial and somatic Prosthetics (McKinstry, 1995). 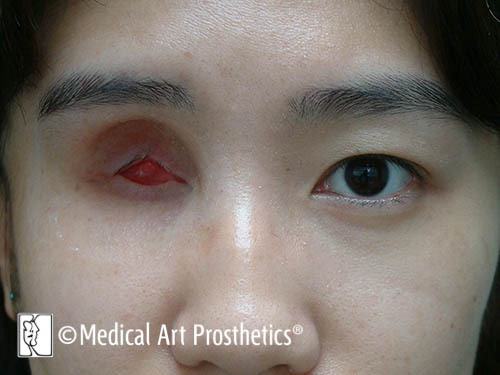 The technique was also included in a chapter on orbital prosthetics in Principles and Practice in Ophthalmic Plastic and Reconstructive Surgery (Bosniak, 1995). Of critical importance is that the bulb portion of the prosthesis seat absolutely passively in a very accurately captured exenteration cavity. The bulb walls are generally less than 2 mm in thickness with a mid-low durometer silicone. 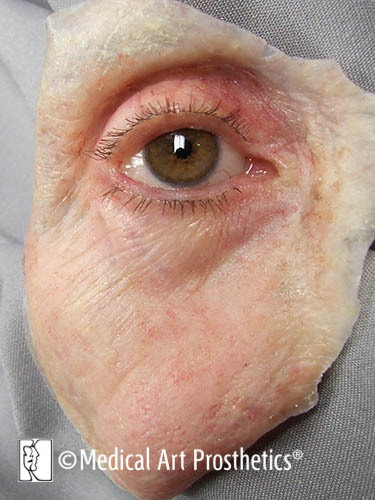 The technique was painstakingly developed to allow the elderly patient to enjoy their prosthesis without adhesive or fear of tissue trauma. 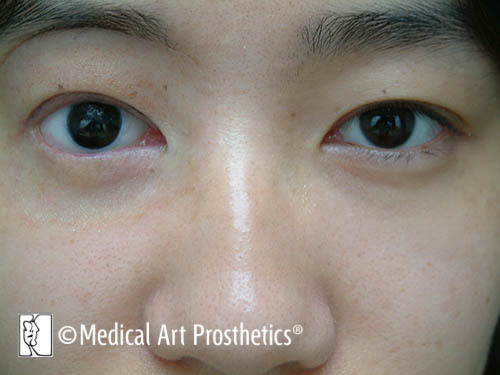 The larger orbital prosthesis is sometimes classified as an upper facial prosthesis or hemifacial prosthesis. 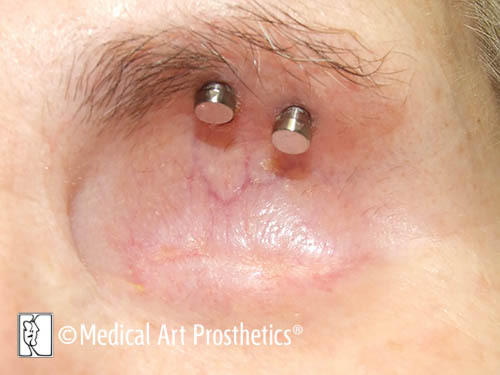 Orbital exenteration with hemimaxillectomy is a very ablative surgery that necessities a larger facial prosthesis. However, the prosthesis is designed very light in weight with a magnetic connector so that it may attach to the intraoral dental device called the obturator. 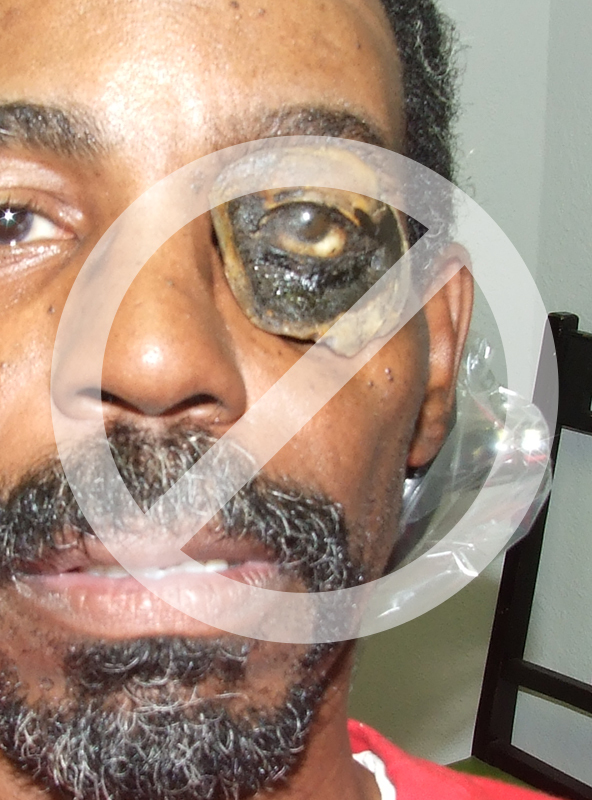 Our design allows easy placement of the orbital prosthesis. Both the intraoral and extraoral components snap together with specialty titanium encased corrosion-proof magnets we have identified for this purpose. The two prosthetic components thereby stabilize each other. Taking this intensive approach we turn the devastating effect of the surgical deficit into an advantage for the patient. 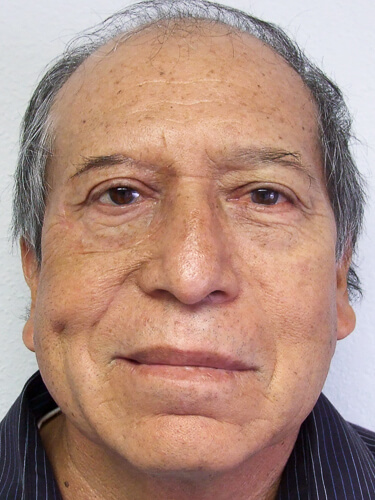 After losing all 3 implants our client received a 2-piece magnetic prosthesis which positions into the cavity as easily as the previous implant-retained version. It stays in place with no adhesive just like the implant version did, but the orbital cavity now stays cleaner and is easier to maintain without abutments to clean around. Our experience allows us to exploit opportunities that we know will make the patient’s life a lot easier with the prosthesis. 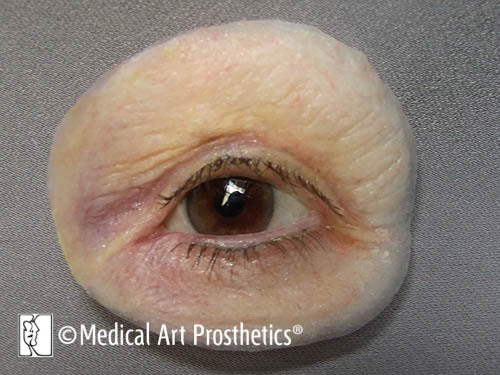 The approach of Medical Art Prosthetics toward the creation of an orbital prosthesis involves medical, artistic and prosthetic components – none being more or less important than the others. Trained in basic medical sciences we understand involved anatomy to communicate with surgeons. Skilled in art we call upon natural talent to render color and form in ways that no technology can. 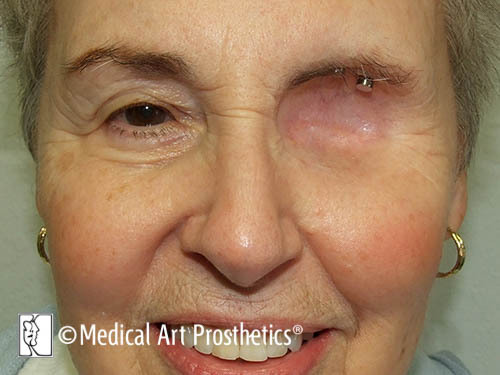 Experienced in prosthetics, specifically facial prosthetics, we have designed, fabricated and fit more truly aesthetic orbital prostheses than any provider in the United States. These images represent what takes place during the 2‐4 office sessions we have with our patients. 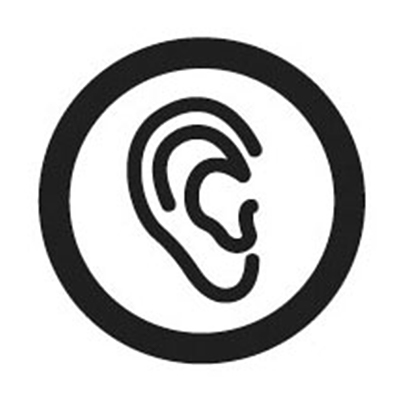 We are very flexible and can compress or extend the visits to meet the travel or time constraints of each patient. 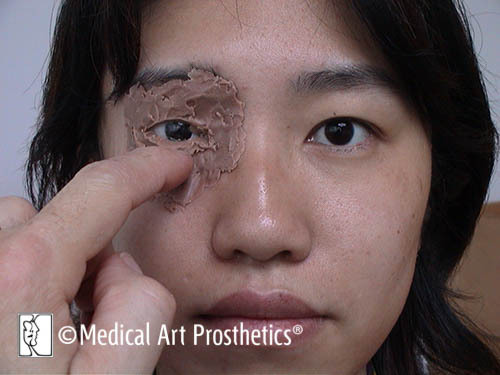 Specializing in orbital and silicone facial prosthetics means that our work is accomplished very efficiently. 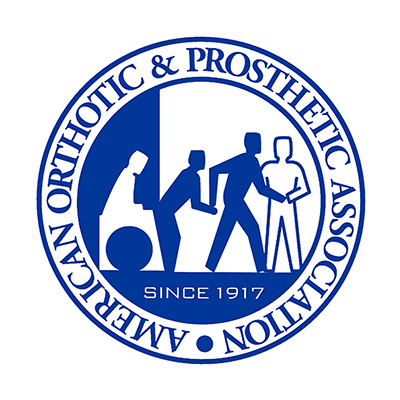 Implant-retained orbital prostheses have been created by Medical Art Prosthetics’ anaplastologists since 1984 – some of the very first available in the United States. The osseointegration process is carried out in conjunction with various surgeons such as oral and maxillofacial surgeons, Craniofacial surgeons, head and neck surgeons, oculoplastic surgeons or plastic and reconstructive surgeons. 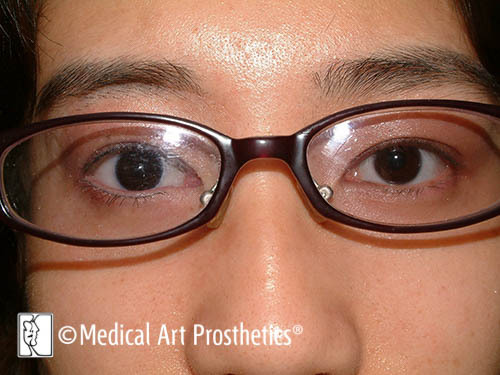 Medical Art Prosthetics has worked with many surgeons across the country to plan the surgical procedure for the precise placement of the fixtures. 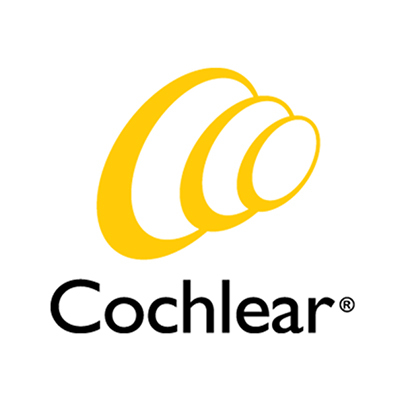 Hundreds of the craniofacial fixtures have been placed for patients of Medical Art Prosthetics, including many of the most recent advanced versions of Cochlear Americas Vistafix 3 System. 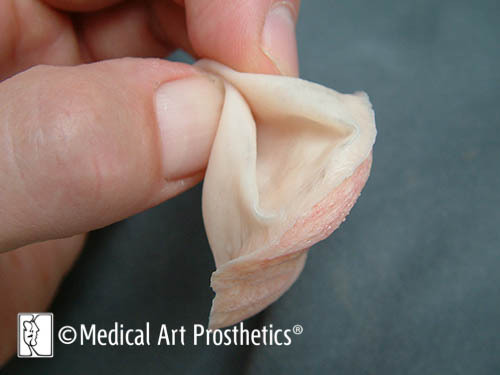 We spend time with each of our clients to go over how their prosthesis is positioned, removed, cleaned and cared for. 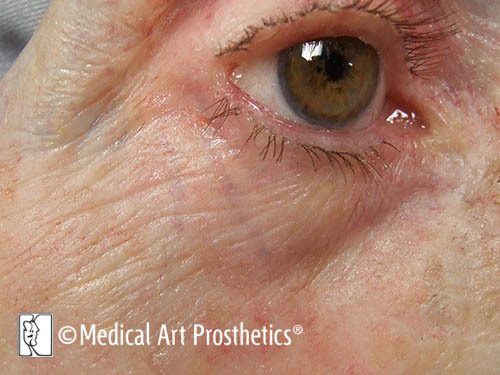 Complete care and hygiene instructions for the orbital or larger upper facial prosthesis are also provided as a complete package. We have encountered virtually every type of patient situation, and we enthusiastically share results of nearly identical situations so you know exactly what type of outcome you can expect. The process always starts with you calling or meeting with us. 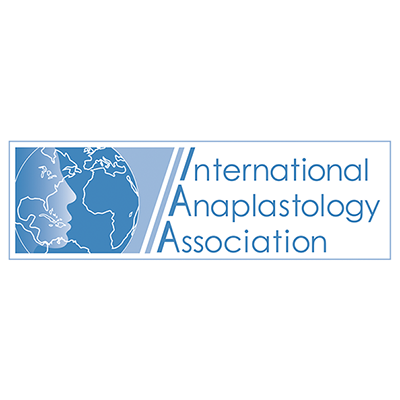 We can answer your questions, outline a treatment plan, identify surgeons if desired and start the process online or over the phone; in many cases, even before you meet with one of our anaplastologists. Provide the necessary permissions and any insurance information via email, our website or by mail. Our staff is experienced with insurances and will verify any benefits and obtain authorizations on your behalf so we can begin promptly. 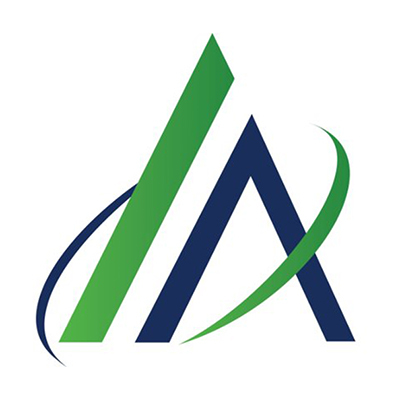 We are ready to work as a team; with you and with your referring physician to assure the services are authorized in total compliance, for maximum reimbursement and with minimal stress. Plan your visits or your trip to have your prosthesis made. This is not a hurried process, but rather a very focused and efficient method for us. We draw on some new technology to assist, but mostly it is an inspired, artistic effort that brings about the best results. Please contact us today, and tell us your story. 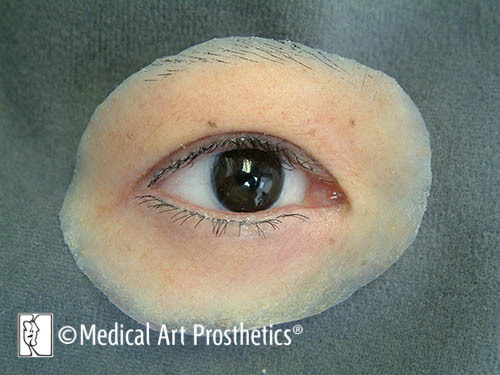 Your best eye prosthetics options are backed by world-class expertise. The color is good, its easy and comfortable to wear, it looks good on and it’s easy to care for. It’s great! Thanks again for a great job. You are an expert. So, thank you Greg! I absolutely love it. Thank you for making me not absolutely despite getting photos taken anymore. My mom is still shocked that she has a hard time, at first glance, telling which is my real eye and which is the prosthesis. Pretty crazy! My eye is fabulous! I’m still seeing people I haven’t seen in years and they can’t tell until I tell them about it! Everyone tells me how unbelievable it is. Close family weren’t sure which eye. A true testament to your craft! I praise the heavens for you and your commitment to helping me restore my self-esteem. I think of you daily. You are the apple of my eye!